Working as a freelancer from the confines of ones home isn’t as palatable as the images it may conjure. Besides a disciplined work environment – which needs to be strictly self imposed by freelancers – you miss out on the day to day office camaraderie, the human connection, the collective sense of belonging to a place. While not contesting on the shade of the grass on either side, when I find the scales tipping in other’s favour i.e when I start feeling cooped up and lonely, I simply carry my work, 5 mins from my house, to the nearest coffee shop, where I get people to sit around me while minding their own business, listen to pleasant music and have access to air-conditioning, wifi and plug points. To my surprise and delight, there is no dearth of the like minded, so much so that between 9 to 5, it is hard to find a place. There are official meetings presided by dapper looking men and women over cappuccino and cookies. And these madams and sirs care to perch their prissy bottoms only on the plush leather sofas with handrest (also the most coveted in the entire cafe) by the windows with the lovely view. If this coincides your entry, it pays to linger around, as they usually leave as soon as they finish their drink or their talking. 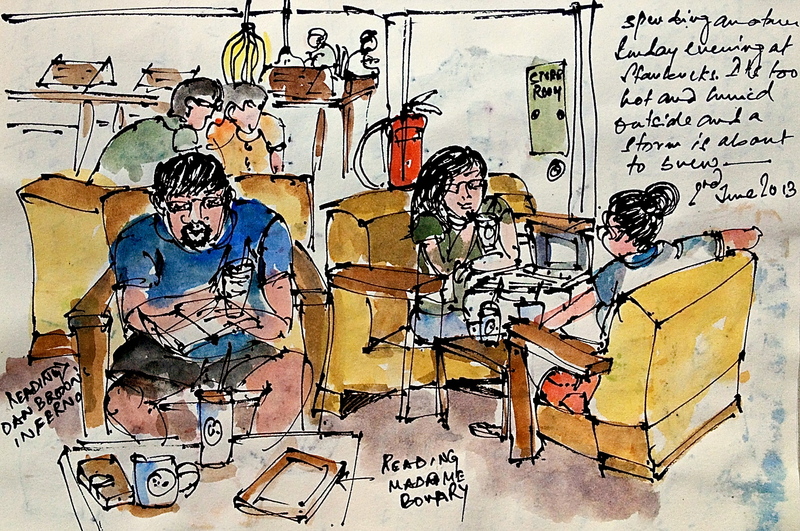 But the same theory is redundant when it comes to the cafe’s biggest headcount – the scraggy school kids finishing assignments over a glass of plain water and maybe, just maybe a tall sized green tea frappe that was finished eons ago and has the frothy bits left at the bottom. Now, they cost the cafe, the entire upper and lower deck with high stools and convenient plug points. And they also kind of live here, only getting up for toilet and food breaks (which is usually a packet of chips). While away which sometimes is for an hour, their personal laptops in dayglo covers, scribbled notebooks, stationaries, chargers, headphones, snacks, wet wipes and sweatshirts scattered on the table will stand sentry. Yes, it’s Singapore, nothing gets stolen but avoid this zone like plague, if you wish to be seated in this lifetime. Then there are the moms. All kinds of moms. The ones feeding chocolate fudge cake to their primary schoolers sitting upright (only at the behest of mommy), and doing their home works; and the ones with toddlers learning to use cutlery and making a gruesome mess by repeatedly stabbing the delicate chicken puff, while their eyes are peeled on the iPad; and lastly the pregnant ones with a wailing brat in tow, struggling to get a heaving stroller (from the weight of groceries) inside the cafe door with one hand and shoving the pacifier into the child’s mouth with another . Moms populate the cafe’s alfresco seating so their kids can run around and chase pigeons, when they can tear away from their wondrous gadgets. If you’ve been around for a while like me, you’ll know – smaller the kid, battier is the mother, and the fidgety she gets, higher is the probability of finding a seat. So hover like a bee over a bed of flowers. Your luck might just turn. The rest belong to the mixed bag, where taking your chances could be be a bit hit and miss. Like the older school kids in uniforms caught in between school and private tuitions or college goers, congregation of elderly people or maids on their off days. They could leave in an hour or lounge for half a day. I’d play it by the ear. But if you are desperate for a seat and nothing else has been working, you might want to sneak up on those sitting all by themselves – alone with their coffee and reading a book/newspaper or updating their blog or looking at Google maps. Most of the time, they get bored with themselves too easily and leave. Jump right in. Saving the best for the last because you spot this kind only if you are alert and have been paying attention – the kind that rolls in, does their business and leaves. Pin your hopes on anybody without a laptop. Or without a smartphone, but that’s asking too much in Singapore. Watch out for people with big shopping bags, or those with dogs, or those taking quick interviews ( I’ve been witness to many job interviews over coffee – lasts as long as the drink), making a hurried presentation, mulling over houses with property agents or bickering like the two local film producers I came across, trying to prove whose job sucked more. I could swear, their heated debate rose to a crescendo but cut out as soon as the last drop of coffee trickled down their throat. After which they left and I moved in. 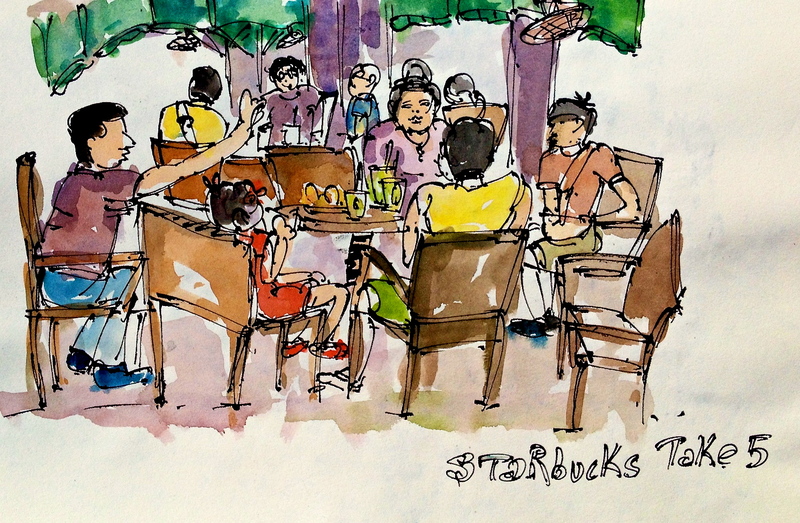 It is within this group that, if you are lucky, you get a seat that isn’t already choped – a typical Singaporean phenomenon of reserving seats by placing a harmless tissue or hasn’t been pooped upon by one of the three notorious pigeons that pick at the leftovers. I have honed my seat grabbing skills over three years of Starbucks patronage at my neighbouring outlet where I’ve worked, planned vacations, played scrabble, finished several tomes and drank gallons of coffee and tea. 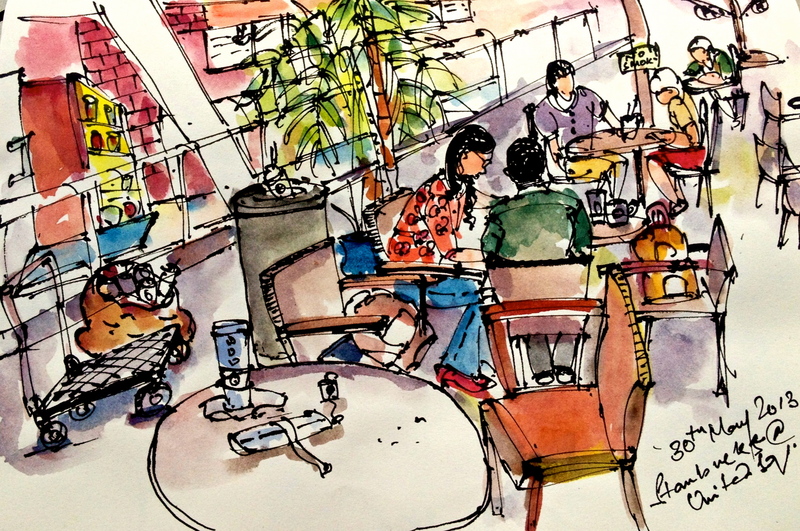 And only recently, have I started sketching and it isn’t surprising that in my 90 page sketchbook, which I finished recently, there are more than twenty sketches done at this location of the same individuals, groups and clusters I talk about. 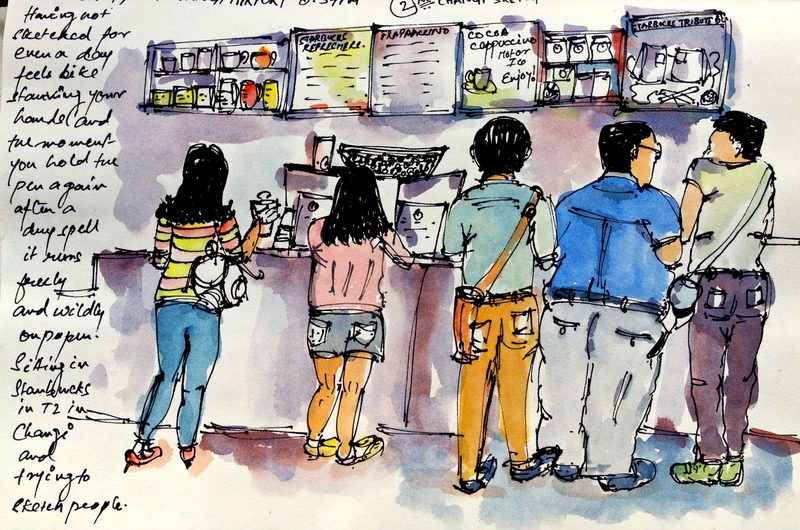 I observed them only because I sketched them. drawn sketches instead of photographs. 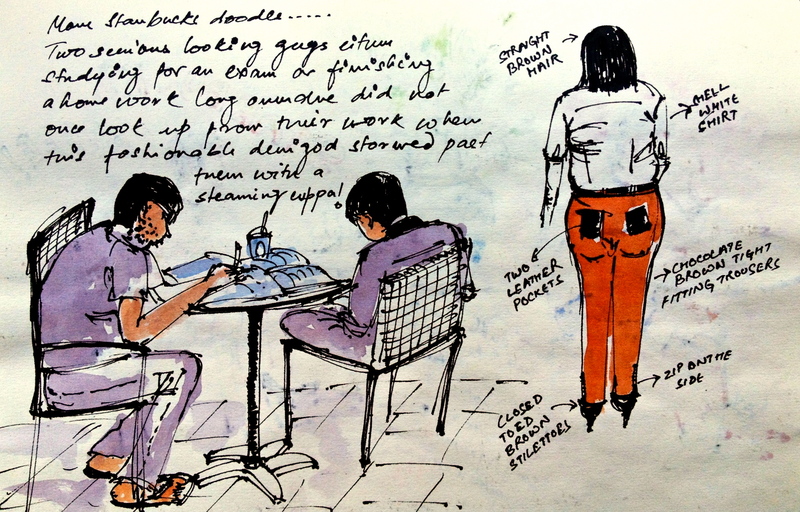 More than any other medium, sketching requires complete immersion of senses, gets you to pay attention and slow down. 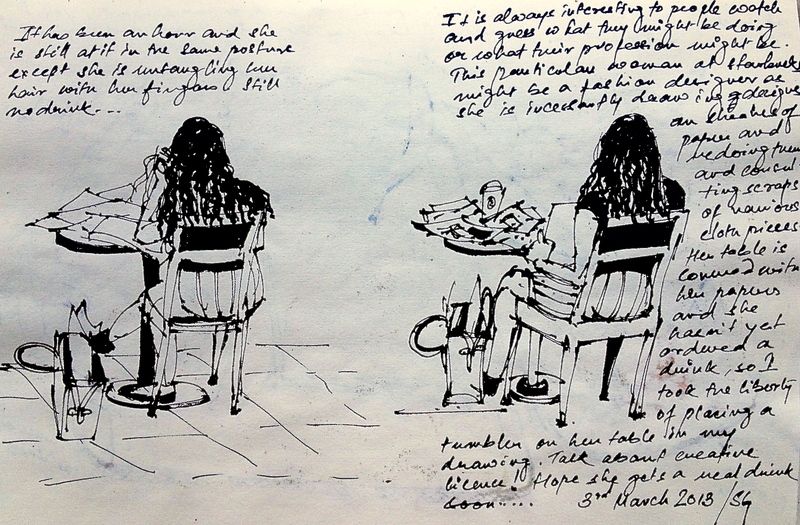 Any sketch when looked at several days or months later, evokes the moment, in its tiniest details. Like this hand carved wooden panda bear pen that was sold to me at the cafe by an ex-convict with heavily tattooed legs. The opening line of his very impressive speech, that led to the sale was, ” Do you believe in second chances?”. Cheesy, yes? 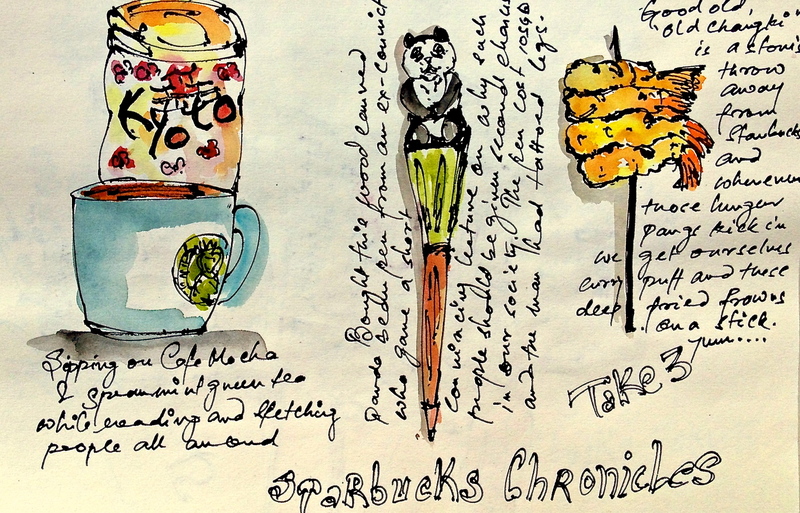 But the sketch helped me pin that memory down. 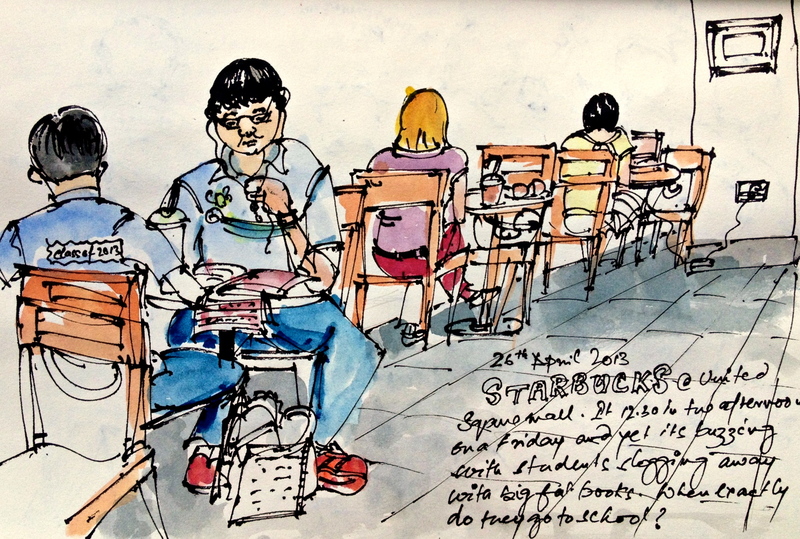 This entry was posted in Daily Vignettes and tagged cafe, drawing, people watching, Singapore, sketching, Starbucks on June 7, 2013 by Somali Roy.